I am a storyteller and word-weaver and I invite children of all ages to ignite their imaginations through the stories I tell! Drawing on the oral traditions of many cultures, and using music, games and puppets, we travel around the world meeting characters who make us laugh, and teach us about ourselves. I will create a storytelling program that meets the unique needs of your child or event, whether it is a birthday party, a summer camp, a school program or just a celebration! In our screen-based culture, storytelling offers children opportunities to imagine and to dream! Please contact me for your next important event. Debby was our storyteller for my daughter's seventh birthday. We had a big crowd, including children of all ages, and both girls and boys. 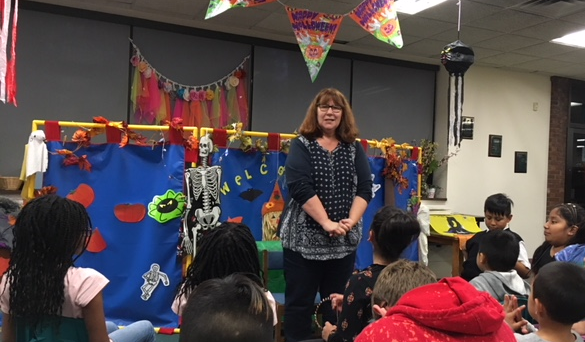 She was able to adapt her program to engage the children for a full hour, and included stories from around the globe, a fun game of "dragon says," and puppets. My daughter's favorite story was Debby's closer about a giant. This one engaged the boys as well. Debby showed up on time, and was very personable and pleasant. Her fee was reasonable. I would strongly recommend her for home parties or library events. I really enjoyed story-telling for your daughter's birthday party. There is nothing more rewarding for me than helping children to use their imaginations and enjoy a few stories! It was a delight to watch them relate so thoroughly to the stories, the songs and the puppets! They were the best audience! Debby presented wonderful stories that fit with our theme and kept the children interested. Thank you Joann. It was so much fun to be the opening act for your awesome summer camp! The fact that the audience included kids in kindergarten through sixth grade who all had a good time, demonstrates yet again the appeal and power of storytelling! Thanks for having me! Debby spoke at our recent young adult seminar. Her ability to listen to, understand and then inform our audience was clearly fueled by her enormous amount of research and knowledge in the field of relationship skills. Many of our attendees were preparing for marriage. Debby had a long line of people at the end, wanting to book personal time with her. I am a storyteller and a weaver of words, and I invite my audiences to travel with me to places foreign and familiar. Drawing on the rich, oral tradition of storytelling from many cultures, I help children of all ages to see themselves in the characters of the stories I tell. Incorporating movement and song, my storytelling is interactive and educational, as well as lots of fun, and I can tweak my tales and my style to meet the needs of any size event with any age children. In our screen-based culture, storytelling is an oasis that offers audiences rich opportunities to imagine and dream! I began my career in the field of early childhood education, and over the years shifted into the area of relationship and marriage education. I have been teaching workshops and seminars for twenty years to audiences of all sizes and backgrounds. As an educator, I have relied heavily on humor and storytelling to convey important skills and ideas, so it was a natural segue for me to move into the time-honored tradition of oral storytelling. I am consistently amazed by the power story-telling has to teach, comfort, heal and bring joy, and it is a privilege to step into people's lives as a storyteller. Storytellers require very little! A chair, sometimes a microphone if it is a large crowd or outside, and a willing audience! I bring my own props and/or materials. I have strongly influenced my motivational speakers such as Les Brown and Tony Robbins, and by authors like Brene Brown and Maya Angelou, Two of my favorite storytellers are Kasony O'Malley and Jan Blake.